If I'm not mistaken, this is a children's puzzle, but it got me thinking for a while. The bus is driving on the autobahn. Relative to you, which way is the bus going? Left or Right? I saw this problem on a web page once. The initial thought that most people have is that you can't tell, because the bus is totally symmetrical. However, this misses one important detail that apparently children will imply in their minds more often than adults. 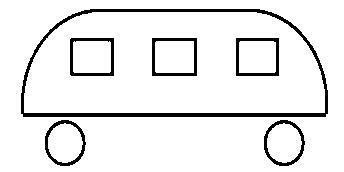 The canonical answer is that this picture of a bus is missing its door, and therefore the bus must be going left, because the door is on the right side of the bus and there's no door visible on the side that's facing you in the picture. Of course, as Gilles pointed out, depending on which country you're in, the bus could be driving on either side of the road. If you're in Britain or some of the Commonwealth countries, then the bus must be going right, because the door is on the left side of the bus. And depending on where from the bus you're exiting, the door could be on the top or bottom as well. I've never seen a bus that had its wheels so far below the chassis like on this one, and maybe there's a stairwell that opens from the bottom to let people in and out. Alternatively, it could be a maglev train given that the car appears to be floating above two round things. A maglev train has doors on both sides. In both of the above cases, you can't tell which way the vehicle is going without further information. The question was updated to indicate that the bus was driving on the Autobahn. However, a bus on the Autobahn sounds really unsafe, and so we might actually be viewing a tipped-over bus from a bird's eye view (it would certainly explain the detached wheels). In such a case, you still couldn't tell which way the bus was going unless you knew which side of the highway it was driving on. Another way of looking at it, this image looks much like the grill or front face of the bus. With that in mind I would answer that it is going neither to the left nor the right from my perspective. Relative to me, the bus is advancing directly at me. I know this has been answered already. But thought I'd add my opposite thought. Under the assumption that you haven't just stepped into the middle of the autobahn, and that the bus is heading in the correct direction. The bus must be on the side of the road closest to you, otherwise you would have a crash barrier in the way.